Whatever happened to the simple city bench? Across Paris, above ground and underground, new furniture is appearing that radically changes our perspective on what constitutes a seat. The designs are attractive, amusing even in the Metro with their smiley faces, but the reasoning behind their shape is less glorious. On the Avenue de France in the new Paris Rive Gauche development, the benches that line the road are just simple metal bars. The design makes sense as an ensemble, matched with the sculpted tree holders, but who would ever sit on this post and for how long? Most importantly of all for the city planners one imagines, nobody is ever likely to loiter here either, and it is sure that no-one will ever lay down here and sleep! 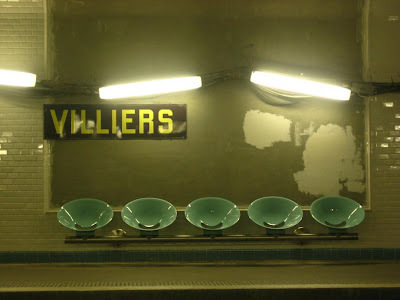 Similar concerns in the Paris Metro. A quick look through history shows how the ideal seat has evolved. In 1910, stations were equipped with wooden benches, but the latest model, the 'smiley', follows the more recent choice of providing a row of separated plastic chairs. 'More comfortable and easier to clean' boast the RATP, but once more the concept would seem to be rather to ensure that nobody relaxes for too long here. City dwellers today are also apparently more comfortable with a little extra space between themselves and their fellow travellers. So where is it still possible for somebody to lay down and relax in the city today? Not the Parc de Belleville apparently! 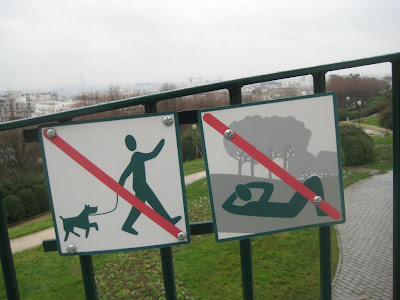 Here there is no suggestion that ball games or picnics would be problematic, but rather the dangerous individuals who want to lay on the grass. The best place to relax today would seem to be in your own home, but the city bench was also traditionally the home of those with no roof above their head. Where do they lay down today? The Smileys look like lovely teacups for green tea, although you would have to be very flexible to lie down across them. I guess the flip side of this is when you see some one passed out on a bench and the four people who would like to sit there are standing. Well the main reason for changing street furniture into those bars and seats is -as you imply but not explicitly say- to prevent homeless people to lay on them and is part of this whole unofficial campaign that tries to make the streets of Paris totally unpractical for homeless people. I guess not seeing poverty will make Parisians think it doesn't exist. David & Christine - I think you both touch on the truth here. I specifically didn't bring this all down to a city vs the homeless battle, because I'm not sure that's the whole story. The park bench is also where groups of young people tend to congregate too, and city authorities seemingly want to put a stop to this too. On the flip side, as Christine points out, people still want to sit down on an object that is comfortable and clean, and in my opinion, where they are divided from others. I think most Metro passengers are happy to have a little individual seat whilst they wait for a train, so they are also responsible for the these new designs. That sign forbidding lying down is pretty amazing. Then again, are you sure it's not against people doing sit-ups? Le parc de Belleville a donc bien changé depuis que j'y suis allée. A l'époque il y avait des allongés. Ont des petites gueule bien sympathiques." Eux non plus que les personnes un peu fatiguées, comme mes parents lorsque nous allions nous promener avec les enfants. Ceci dit au bout de ma rue il y a une coulée verte. Les bancs ont été enlevés, non pas à cause des Sans Domiciles Bixe mais à cause des réunions de jeunes en bande. I agree with David. The city has almost found a way to keep people from sleeping on the benches, but in the first picture, they seem to have forgotten about the area next to the "bench". Parc de Belleville was over-run by joggers when I was there. How about sign banning those lycra-clad pedestrian hazards? 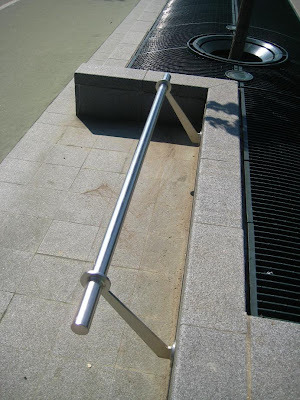 That seating bar might also be used to prohibit skateboarders, who love an edge to slide on. A sign saying no prayer will probably be nest. I saw a guy praying to mecca in the Champ de Mars. I would have thought that the Eiffel Tower would have misaligned his allah compass.